Source : I got the information off the Census' American Factfinder site. I chose the 'housing' and then 'financial characteristics' options in the left margin. 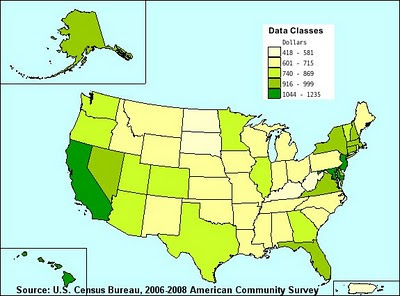 The resulting page had an entry for "Median Monthly Renter Costs, map by state" and if you click that link it shows the map of the US with different colors representing different rent levels. From that page there is also an option on the left to view as a table. This is the link I used to get the table but I'm not sure if it will work statically.